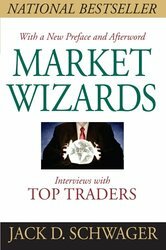 Market Wizards is one of the books I would highly recommend you read if you’re interested in trading. Written by Jack D. Schwager, it is essentially a compilation of interviews he carried out with some of the best traders in the world. He asks them all very probing questions and you get an amazing insight into the minds of the best in the business. I will almost never recommend a book that is based solely on the technical aspects of trading. If you want to learn the technical side of things, you can learn it online, by using demo accounts, and yes, almost every technically based trading book goes over the exact same aspects – support and resistance, candlestick patterns, risk-reward etc. The reason I love this book so much is because it delves into what I consider the ‘real’ aspect of trading, and that is, psychology. Reading through the interviews of traders who have made hundreds of millions throughout their career, it is beneficial and encouraging to see that they too, are only human! What are the clear messages I pulled from the book? Well the first one is that almost every trader in the book blew at least one account. When they did this, more often than not they felt like utter failures. They grew frightened of the markets and thought about giving up… sound familiar? I’m sure it does! Another overriding message that came through was that the reason for first going broke, and then learning from the mistakes and building a successful career was money management. Although understanding the markets and developing your skill is of course crucial, all of them said that money management was key. They went broke because they risked too much and the market chewed them up. This didn’t necessarily happen at first – some of them had made hundreds of thousands of dollars by the time their flaws showed. But in the end, poor money management, risking too much, was their downfall. I know I bang on about this over and over, but there is a good reason for it. And reading the transcripts of interviews from the best traders in the world, they also force the point home. The number one rule is to protect your capital. Short post today, but as I’m recommending a book to read, I don’t want to then outline the entire book for you. You’ll also need to dive over to Amazon and find the book yourself. I’m not going to be one of those people who posts the amazon link that then results in me making a few pence for every purchase you make! Thanks for the recommendation James. Got it of Amazon. I think the key to successful trading is mastering the emotional element. Hope you enjoy it Pari. Working on the emotional aspects of trading and the psychology behind it is definitely what seperates the amateurs from the professionals in my opinion. Hope you enjoy it.